An 11-year-old girl died when a tree toppled onto a car outside her house in Newburgh as her mother was unloading the vehicle during the storm Tuesday, police said. Newburgh police said emergency responders were called to the Robinson Avenue home around 4:15 p.m. for a report of a girl trapped inside a car after a large tree toppled onto it. "The mother was on the porch, crying, 'My daughter, my daughter,'" witness Ramon Rodriguez told News 4. "It kind of gave me a chill when I first saw it." Rodriguez said the rescuers did everything they could to free the girl using the Jaws of Life; after she was extricated, the girl was taken to St. Luke's Hospital and pronounced dead. Her mother suffered minor injuries. Police were not identifying the mother and daughter Tuesday night. Newburgh, in Orange County, was among the Hudson Valley communities hardest hit by the wild storm, which left nearly a quarter-million customers without power in the tri-state amid flooding downpowers, quarter-size hail and gusty winds. 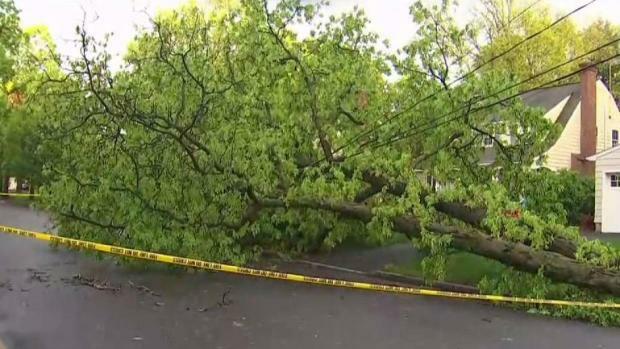 A second storm-related death was confirmed late Tuesday night: in Connecticut, a man was killed when a tree fell on his truck, according to Danbury Mayor Mark Boughton. Thunderstorms pummeled the entire tri-state through the evening commute, leaving behind destruction that's already prompted states of emergency in Dutchess, Orange, Putnam and Sullivan counties. In Danbury, officials said schools will be closed Wednesday because of widespread power outages and downed wires through the city. Check school closings here. 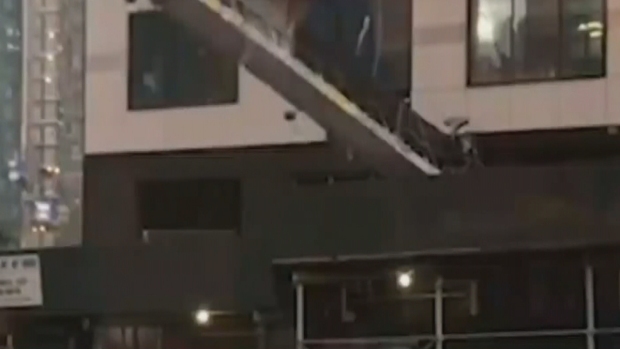 In New York City, giant metal construction pieces and scaffolding were no match for the fierce winds -- they were sent whipping and spinning into the air, plunging dangerously onto the street. Toppled trees were a common sight across the city -- in Central Park, in Brooklyn and East Harlem. Uprooted trees were reported across New Jersey, too. In Ho-Ho-Kus, a tree fell on Bernard Place, hitting a house and car; houses were also seen crushed by trees in Wyckoff and Scotch Plains, along with live downed wires. A lightning strike is believed to have been the culprit for a car fire along Route 46 in Clifton. Over 250,000 customers were without power across the tri-state during the height of outages Tuesday evening, though power was starting to come back on through the night. NYSEG alone had 81,000 customer outages at its peak; the company says it's mobilized crews to its service areas in Westchester, Putnam, Dutchess, Delaware, Orange, Sullivan and Ulster counties, which appear to have been the hardest hit. Several Metro-North lines were briefly suspended amid the storms, and the MTA temporarily closed Grand Central Terminal to prevent overcrowding. Subway riders also complained on social media about dangerously crowded platforms and passageways amid delays and service changes. Parts of the Hudson Valley, which had seen several tornado warnings come and go through the afternoon and evening, were reporting some of the heaviest storm damage. Several residents in the Ulster County town of Woodstook took to social media to post videos and photos of hail pelting their homes and back decks; another posted a photo of three marble-sized pieces of ice that had fallen out of the sky. And in the Sullivan County town of Monticello, resident Ryan Camasca posted photos of downed trees and snapped limbs and fences at his farm and garden store. "It was around 3:50 p.m. when the storm hit," he told News 4 on Instagram. "Suddenly the sky turned black and the power started to flicker in and out. Then everything went black. The next thing I know, the rain is coming down so thick you can barely see outside." Sullivan County Manager Josh Potosek declared a state of emergency for parts of the county through Wednesday, saying that damage in some parts were nearly as bad as the March 2 blizzard. More information can by found at the Sullivan County website. Dutchess County Executive Marcus J. Molinaro has also declared a state of emergency, restricting travel on roadways as crews work to clear roads of hazards. In addition to Sullivan and Dutchess, Gov. Andrew Cuomo has also declared states of emergency for Orange and Putnam counties. Earlier, the National Weather Service said a tornado touchdown had been confirmed in Yulan, Sullivan County -- near Highland Lake -- by a trained spotter at 3:30 p.m., but later said the report was incorrect. The Hudson Valley was hit especially hard by Tuesday's storms. Michael George reports. 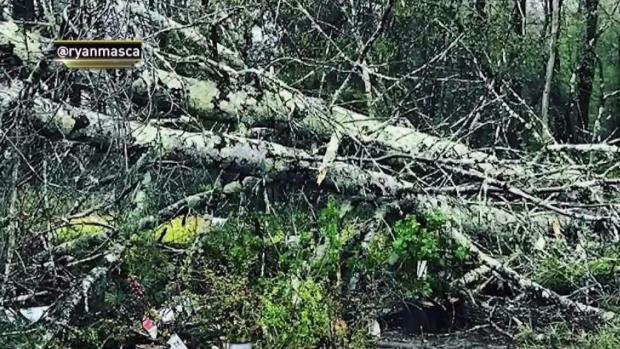 In a statement apologizing for the initial report, the National Weather Service said the spotter did not sight the tornado on the ground, but only phoned in a report of damage in the area of Yulan. The NWS says it will be sorting through the damage reports and consulting with local emergency management officials to determine the need and location of any storm damage surveys. 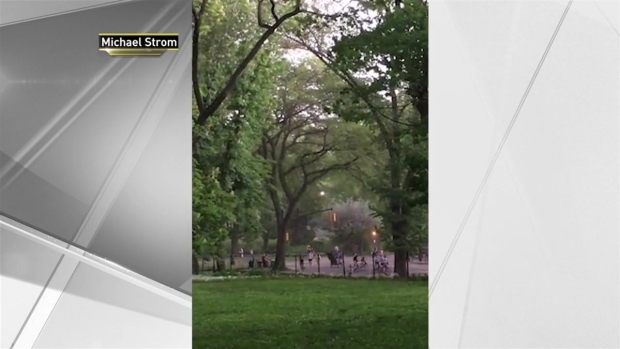 Nevertheless, meteorologists -- from Storm Team 4 to the National Weather Service -- had described the continued storm threat as having the chance to bring the most severe weather the tri-state area has seen so far this spring. Storms diminished after dark, but the rain will continue intermittently into Wednesday. Temperatures will also plunge, with only a high of 65 degrees expected Wednesday after an 87-degree forecast Tuesday.